This post is brought to you in cooperation with Sports Illustrated Kids. Every year, Sports Illustrated Kids chooses one child to be SportsKid of the Year. This year, they are still on the search for that child. If you know a kid who is between the ages of 7-15 who demonstrated amazing sportsmanship, in their accomplishments on the field, in the classroom and in their communities, then head on over to the SportsKid of the Year page and nominate them now through October 7th! 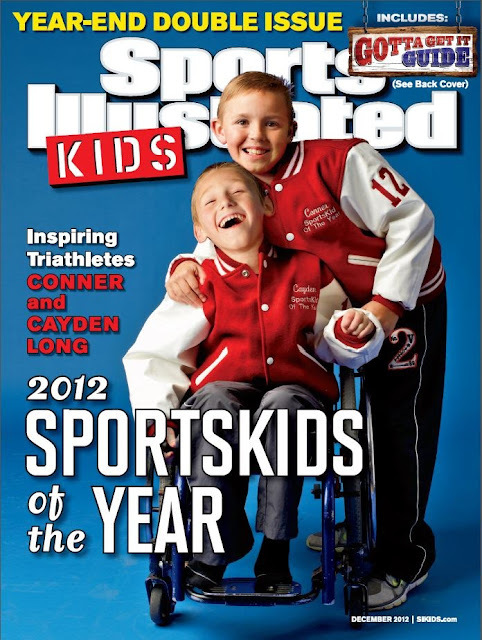 The winner of the Sports Illustrated Kids' SportsKid of the Year award will be featured on the cover of the SIKids December 2013 issue, receive a special SportsKid of the Year jacket, and a trip to New York to receive the award at the Sports Illustrated Sportsman of the Year ceremony. Last year, not one, but two amazing brothers received the SportsKid of the Year award. Connor and Cayden Long have a truly inspirational story, and the video of their story went viral, receiving over a million hits and garnering national media coverage in just days. You can check out that video below, but I warn you, it will bring tears to your eyes. It's never too early to stat thinking about Christmas presents either. A Sports Illustrated Kids subscription is the perfect holiday gift for children who have a love of sports. SIKids presents sports to kids the way they want to read about them, through easy-to-read stories, great action photos, as well as comics, activities and tips from the pros. You can visit the Sports Illustrated Kids site and get a one year, 12 issue subscription for only $19.95. While you're there, don't forget to nominate a child you know for the SportsKid of the Year award. I can't wait to see who wins this year! Our blog is participating in a sponsored blog ambassador program from Sports IllustratedKids. As a part of this program, we have received paid compensation and a year subscription for placement of digital advertisements and specific postings related to SI Kids. Ahhh tears for sure!!!! So heartwarming. I love this! I wish I knew someone to suggest. I know of a couple of kids that I could suggest. I love this! I love celebrating kids like this so much! We are a sports loving family and my kids cherish the issues of SI Kids they receive in the mail. It was a gift, so I had no idea a subscription was just $19.95!